When I'm a little white-haired old lady, who will no longer be able to hoist large boards onto my table saw or band saw, nor have the energy to handsaw them, I will carve, make decorative boxes, and whittle. Recently, I bought a book entitled The Little Book of Whittling, by Chris Lubkemann, that clearly explains how to make simple letter openers, spoons, birds, forks, chickens, and tiny canoes, among other things useful or amusing. Whittling is something that intrigued me as a kid. I remember using one of my dad's pocket knives to sharpen sticks, carve designs in them, and make sling shots. I never progressed beyond that, but I do remember having a great time. And feeling cool. Like Opie Taylor. So, until I can get back to working with bigger tools (in exactly 23 days), I'm going to fiddle around with whittling. Today, I'm making a spoon or a whistle and then I'll show the neighbor kids how I made it, which will no doubt amaze them. And they'll think I'm cool. The coolest brown-haired, middle-aged lady on the block. That book is kind of cool too. I did the same thing...I "borrowed" my Dad's pocket knife and carved something into many different wooden surfaces. I made a little sail boat once...put a little paper sail on it and watched it float away! I wish I had a cool lady like you in my neighborhood when I was growing up! a Hound dog and a big ole cement pond. Ah...send me the real estate agent name...I'll look it up. We can whittle away on the porch while M and the Presby girl read lots of books. I will be following your whittling experiences with interest. I am off to Boy Scout summer camp in a couple of weeks with my son's troop. I have enjoyed whittling since I was a kid at summer camp. Something very therapeutic about the pace of whittling and watching something pop out of a block of wood. 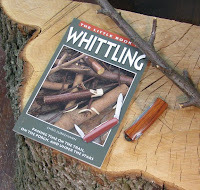 I will have to check out The Little Book of Whittling! I believe you *have* found a way to stay busy with something woodworking! I actually have a "little old man" that's about 4 inches tall. Some friend of my grandfather's whittled him. He's so cool! Vic, you forgot the cutoff breetches! Shannon, I'm with you on needing to take some sort of woodworking with me on vacation. Chip carving is also a lot of fun. I hope your vacation is a lot more enjoyable than mine was! Al, I bet your grandkids would get a kick out of things you could whittle for them. They already know you're the #1 Grandpa, but this will put you over the top! IdentityMixed, there is something about a handcarved or whittled piece. That could be a type of woodworking to teach your boys when they're old enough. And hair extensions, so you can have those braided pony tails. I'm a little small, but I could be Jethro. Wait! Didn't Elly May beat him up a lot? If I'm Ellie May, and you're Jethro, does that make my partner...Granny? She better not see that comment! She'll kick your rear!